The Scarab is a boutique handmade rug store where you will find an invaluable team of dedicated people to help you. We are well respected for our personalized services that support interior design projects. Because we absolutely cater to our customers and interior design clientele, you can think of us as your personal concierge in the rug business. 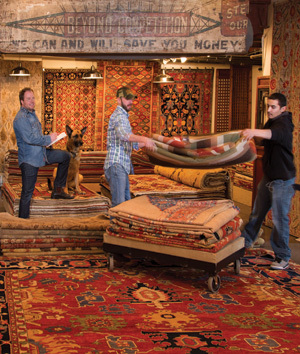 We offer appraisals, consignment, consultation, installation, rug repair, and cleaning services. We are based in the Vail/Beaver Creek resort area. This centralized location allows us to service all of Colorado. However, many of our customers and interior design clientele have returned to us for their rug needs outside of Colorado. The Scarab has just recently completed projects in Georgia, Texas, Florida, Hawaii, and Boston. It was in the early development years of Vail/Beaver Creek that we became acquainted with interior design for the resort lifestyle. My wife and partner Jane Rohr was motivated to start this business in order to provide an avenue back to her family and home in the rug weaving culture of Turkey. Our love of handmade rugs is at the root of it all. Endless creativity. I suppose life itself inspires me. People are always creating; we are constantly unfolding the mystic behind what we each find to be beautiful. When it comes to creativity, the idea of finality is truly obsolete. We are excited to be working on several custom rugs at the moment. It is fun and provides a lot of creative energy. We are also thrilled to be working on a resort timeshare project in Hawaii and a Lexus dealership in Texas. In a world of planned obsolescence in most of today’s marketplace, I suggest buying quality. Everyone in this company thrives on customer satisfaction. We are so blessed to work with some of the most talented interior designers, architects, and builders to create stunningly beautiful living environments. Seeing the finished results of these collective and creative talents is remarkable. It leaves us most grateful and excited to see what new challenges await us. With $10,000 and a prayer. I love Leonard Cohen. Consider this a confession. I have traveled a lot for business and pleasure. But it is my home where I recharge and fill my soul with love, laughter, family, and friends. Altruistic as it may seem, I sincerely wish more people would revere that which we have in common and respect our differences. Recently I realized that for years I had misunderstood Crosby, Stills and Nash’s song, “Southern Cross” and its point of navigational reference. Coming from Arkansas, it again provided me an opportunity to laugh at myself. More than a retail store, The Scarab is an experience. Founded by a treasure hunter from Istanbul, Jane Rohr, and a collector from the southern United States, Larry Stone, The Scarab’s collection of one-of-a-kind rugs and other treasures offers the type of pieces around which you outfit your home. In each rug at The Scrarab there is a story—the weaver, the materials, the country of origin. These stories add character to a home, and the team at The Scarab loves to share the stories behind their treasures. Co-founder Larry Stone, a southern transplant to Vail (albeit a long time ago), loves living in the Vail Valley and takes pride in offering the best service to all of his clients.